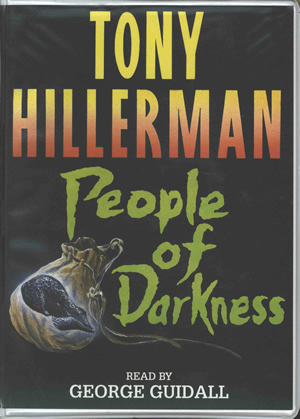 This is the UK edition audiobook of People of Darkness, read by George Guidall onto 5 cassettes. The audiobook has a total listening time of 7 hours. The cassettes are in a beige plastic case with cover insert. On the spine, the author name is printed in black, and the book title in lime green, horizontally on a white background. The publisher name and item number are printed vertically at the bottom of the spine.